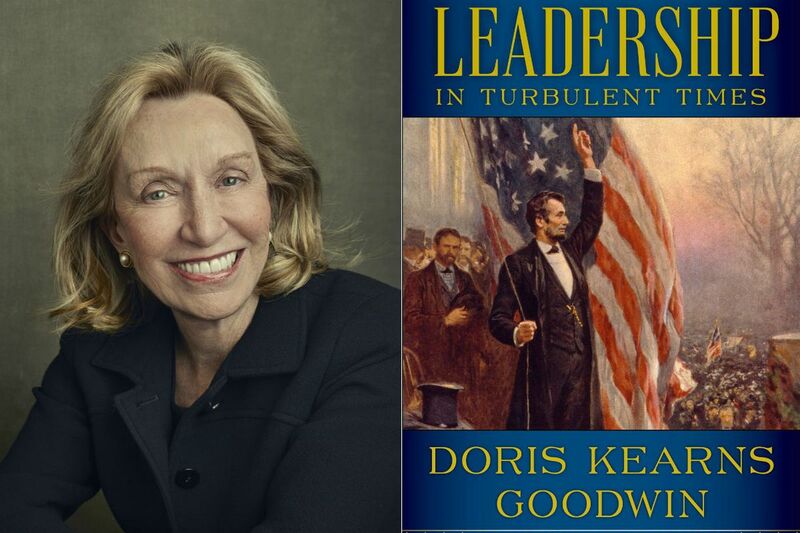 No one is more fun to talk to about history than Doris Kearns Goodwin. She's a Pulitzer Prize-winning presidential historian, and a former assistant to Lyndon Johnson, whose memoirs she helped draft. Her acclaimed 2005 book Team of Rivals was the basis for Tony Kushner's script for the film Lincoln. Above all, she's a person who knows the past and present vividly, with infectious urgency and enthusiasm. She's as engaging in her frequent appearances on Meet the Press as she was in Ken Burns' Baseball, remembering the agonies and ecstasies of being a Brooklyn Dodgers fan. She brings her new book, Leadership in Turbulent Times, to the National Constitution Center at 6:30 p.m. on Monday, Sept. 24. (The appearance is sold out but will be streamed live at constitutioncenter.org/live.) Leadership narrates the high points of four great presidencies: those of Abraham Lincoln, Teddy Roosevelt, Franklin Delano Roosevelt, and Lyndon B. Johnson. From these great turning points of history, she draws lessons about each man, but also about leadership in perilous waters. In promotional materials, she says that we ignore history at our peril, "for without heartening examples of leadership from the past, we will fall prey to accepting our current climate of uncivil, frenetic polarization as the norm." The book involved five years of Goodwin's life, and considerable personal loss. In May, her husband Richard died of cancer. And, as she details below, she found it deeply emotional to return to her years with Johnson and wrestle with how a man who succeeded so spectacularly with civil rights failed so terribly with Vietnam. Below, Goodwin speaks of our present turbulent times, of leaders with courage and political timing — and of a presidential prank by none other than Bryan Cranston. We live in turbulent times. What was the impetus for your book? Many things. I had written about all these men before, but I felt I still needed to know them better. I wanted to know much more about their leadership. When Lincoln took office, 600,000 soldiers were about to die in the Civil War. When Teddy Roosevelt was president, the industrial revolution had shaken society, and there was a mood of rebellion, much more intense than today. When FDR comes to office, the future of capitalism is at risk. With LBJ, the whole world is confused and endangered. Each one of those times cried out for leadership. What these leaders chose to do shines a light on the absence of such healing leadership today. I'm hoping the book provides a road map with which to judge our present leaders. I've been lecturing about leadership for years, and students raise their hands and ask me what it is, what makes good leadership, why we don't seem to have it. I hear them talk about our broken political system — words you were hearing well before the election of 2016. And as our political world got more turbulent, I realized that — even though Trump would not be mentioned in the book — maybe it could set a standard for what real leadership is like, that is, people risking careers for some larger purpose. What's scary to me is that we're accepting our present uncivil polarization as the norm. The idea of Leadership is to be able to look back and say, "We've been through rough times before, and this is what true leadership looked like then." Each man did more than change the policies of our government: Each man changed nothing less than our culture. I'm happy to hear you say that. Lincoln often said that with public sentiment, anything is possible. Each of our four subjects worked enormously hard to change public sentiment. Lincoln had so much work to do that with emancipation. At first, Union soldiers had no desire to fight for it. And Lincoln went among them, personally, persuaded them he was on their side and that they were fighting for exalted, worthy goals. Teddy Roosevelt, by no means an enemy of wealth, saw that income inequality and the trusts had gone too far and threatened the republic, and that led to him busting the trusts — but not until he used the bully pulpit to explain why and win public sentiment to his crusade. During the closing of the banks, at the deepest point of the Depression, FDR had to go on radio, to tell people, "You're safer to wait for a week, then bring your money back to the banks." That next Monday, everyone was worried about what would happen, and people came back to the banks. LBJ had to educate the country about voting rights and civil rights. His "We Shall Overcome" speech [of March 15, 1965, a week after racial violence in Selma, Ala.], was an electrifying moment, when he enlisted that spiritual song to join with people across racial lines and let the public know a new course was being set. These were men with exquisite political timing, at least in their greatest moments. Again, what allowed them to have that timing is their knack for feeling public sentiment. It's a matter of being close enough to your constituency to know when to move forward and when to hold back. They were listeners. Lincoln is reading newspapers, bringing in people from all over the country. Isaiah Berlin said FDR had the most acute sense of timing he had ever seen. LBJ made sure to know every single congressman and senator. After the emotional passage of the Civil Rights Act, he is smart enough to let his civil-rights drive rest for a while before having the vote on voting rights the next year — but when Selma happens, he knows he has to act. They were good at listening to those who disagreed with them, those with different backgrounds and viewpoints. Every single one of these men understood the value of that; it's a trait leaders need. In Team of Rivals, I discussed how Lincoln, on purpose, assembled an entire cabinet of men he knew were his political enemies, and it reaped great benefits for the country. Teddy Roosevelt spoke of how politics broadens you, because you see different classes. FDR had Eleanor, who was a welcome thorn in his side. FDR would stimulate disagreement in his cabinet as a way to spark debate. You have to wonder: Are we doing this today? You saw one of these men up close: LBJ. You saw the triumph and the collapse. Writing about him must have been especially hard. I knew writing about LBJ was going to be the hardest for me. The time I spent with him, at both the White House and at his ranch in Texas, really created the desire in me to be a presidential historian. I will be forever grateful for that experience. Working with him and watching him in those last years created an empathy with him, and I like to think I brought that to each leader I studied in the book. For LBJ, you add a section acknowledging his epic failure in Vietnam alongside his leadership in domestic politics. It was a sad thing to watch the Vietnam policy collapse, but 50 years later, with all the anniversaries of the Civil Rights and Voting Rights Acts, Medicare, and Medicaid, historians are now reevaluating and raising their estimation of him. I'm glad I've been able to watch that happen. Did you get to see All the Way, the LBJ biopic starring Bryan Cranston? I was a consultant for it. Bryan and I got to be friendly, and it was so thrilling to see LBJ come to life like that, to see it all so close. I went out to see the filming in California, and they let me sit and watch while some of the filming went on. Bryan even pulled a prank in one scene. LBJ is sitting on a bed, and at one point, he calls right to me: "Doris, come here and sit by my side!," just as LBJ did so many times. For a second, I thought, "Oh my God, he's back."